With rapidly evolving changes in technology and mounting competitive pressure, organizations must hit the reset button for how they use IT. Given that the latest technology news can occasionally flirt with hyperbole, a suggestion that something IT-related is “epoch-making” might well be greeted with a yawn. But it’s no exaggeration to describe the transition that enterprise IT is currently undergoing in exactly those terms. This transition is going to force senior executives to consider anew every aspect of enterprise IT—from strategy and mission to architecture, infrastructure, applications, security, organization, governance, skills and relationships with users. And when they do, many will conclude that their enterprise IT needs a restart. And for good reason. Today, all businesses are becoming digital businesses; software and technology are now at the core of nearly every industry and function. This calls for a fundamental, strategic rethinking of IT that begins to create a future capability that is competitive and differentiating, even while operating at significantly lower cost. Standing in the way of a successful transition, however, is the oft-lamented problem of legacy systems. For CIOs, they are a major obstacle to their ability to take full advantage of opportunities presented by the cloud and “as a service” capabilities. They also demand a great deal of time, as IT organizations focus on building and maintaining customized capabilities, most of which go unused. An Accenture analysis of more than 30 SAP systems, for example, found that clients use only 23 percent of customized variations and, for that matter, only 70 percent of standard ERP capabilities. Many business and IT executives recognize the extent of the problem. An Accenture Institute for High Performance survey found that if given the chance to rebuild one of their company’s departments from scratch, more executives would choose the IT department than any other. And, perhaps not surprisingly, IT executives said they would do so by an even larger margin than their business peers (see chart). In another Accenture survey, 45 percent of UK executives believe that eliminating legacy systems will provide IT the flexibility needed to meet future user and customer needs. (see chart). If only it were that simple. In practice, CIOs don’t have the luxury of executing the equivalent of a tear-down on a dilapidated house, destroying the old and rebuilding from the ground up. Instead, they have to significantly remodel while still living in the house. And since the digital world can be a dangerous place, they also have to protect the house. While there’s no operating manual for a restart, there are some clear guidelines that can help executives through the process. The catalyst for State Street’s own IT overhaul was a root cause analysis that identified flaws in the company’s business operations. It found that the ultimate cause of many problems was IT-related: the financial services company’s IT architecture, the way the company built systems and how it stored data. For example, it was unable to adequately track trades through each step in the trading lifecycle because there were multiple reconciliation systems, some reconciliation work was still being done manually and there was no system of record. To maintain industry leadership and comply with regulations, the company’s IT platform had to advance. Restarts can also set up IT to support new growth and profitability. One of the most obvious justifications for restarting IT is to support a corporate restart, such as spinning off part of a business as an independent company. That’s what happened when Accenture became a new public company in 2001. A restart can also set the stage to accomplish a number of other goals. Pursue a new growth strategy. When an old IT infrastructure and systems do not suit a change in strategic direction, it’s time to create new ones that can. BB&T, a North Carolina financial services company, started its IT transformation effort when it switched from a growth-through-acquisition strategy to one driven by organic growth, and found itself competing with other companies that differentiated themselves through IT. BB&T’s enterprise IT, designed to integrate new acquisitions and run back-office operations, was completely overhauled to focus on providing new services to clients, reducing the company’s cost of doing business and data security. Enter existing markets and create new ones. Australia Post is a case in point: It needed to make up for postage revenue lost to email and impose order on a messy IT infrastructure. Brought in from Australia’s BlueScope Steel in 2006 to overhaul those old legacy systems, Australia Post’s CIO at the time, Wayne Saunders, invested $500 million to modernize and rationalize Australia Post’s IT infrastructure and organization. That primed the country’s national postal service to grow its parcel, logistics, passport and payments businesses, and to launch an e-services and telecommunications business. By mid-2011, its Future Ready program had enabled Australia Post to grow revenues faster than costs for the first time in four years and increase profits by 31 percent. That look forced the company to reevaluate and overhaul its IT. Today, Western Union provides consumer bill-payment services for hundreds of US companies and an international B2B bill-payment service. Improve the company’s cash position. While the upfront investment in a restart can be very large, the savings can be much greater. By replacing old infrastructure and systems, large companies have saved hundreds of millions of dollars—enough to underwrite the investments needed to restart IT. Since going public in 2001, Accenture’s $1 billion investment in infrastructure and application improvements has led to $3.5 billion in savings, reduced IT spending as a percentage of revenue by 64 percent and brought down the number of applications in use from 2,100 to 495. Accenture’s CIO organization achieved these reductions by consolidating, centralizing and standardizing IT operations. From 2001 through 2012, Accenture cut global applications by 59 percent and local applications by 83 percent. The company also lowered its IT costs by outsourcing application development, maintenance and infrastructure services. Accenture is not unique. By virtualizing its data centers and replacing local homegrown systems with SAP and Oracle modules, Dell reduced the maintenance slice of the IT budget pie to 48 percent and saved $2 billion in IT expenses over five years. State Street projects between $575 million and $625 million in savings from its business operations and IT transformation program, which includes transferring some business applications to a private cloud. It has saved $198 million as of December 30, 2012. Support an overhaul of a company’s business processes. Ford Motor Co.’s One IT initiative supported the company’s One Ford program to make the carmaker a truly global organization with one set of global processes, systems and products. For example, Ford unified regional purchasing systems and databases into a single system that connects employees with suppliers worldwide. It’s clear, then, that companies can meet the demands of a “mandate” to restart IT, provided they go about it in the right way. 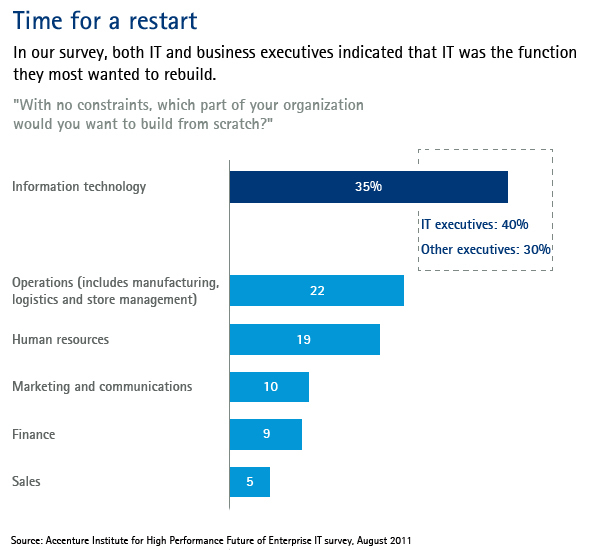 How can CIOs minimize the risks and maximize the rewards of a restart? Building a solid architectural foundation for the enterprise and effective execution are important, but more is needed. Through our research, we discerned five keys to helping a restart succeed. With good IT governance and oversight, the initial commitment to a big, bold project is less likely to wane when other priorities come along. Stakeholders have had their say. There is confidence the decision was correct. Oversight committees have the visibility they need to track progress, costs, security and value. Accenture and State Street both focused on governance once the need for a restart emerged. After Accenture became a public company, it put its internal IT organization in charge of IT planning and management. But it also created an IT steering committee of Accenture’s most senior business operations leaders to confirm key decisions and ensure alignment. The new company set up its IT function to run much like a managed services business that provides infrastructure and application services at market-competitive prices and service levels. Consider looking for models that already have earned the confidence of executives, as State Street has done. The company’s transformation program followed the same successful governance model it uses to manage mergers and acquisitions. “We like the model because in M&A, you’re very clear, accountability is very clear, the results are very clear, the financial pro forma is very clear and unambiguous,” says Perretta. IT does not have to be run as a profit center to be run like a business. What it does need is an IT executive team that knows what it’s getting for its investments, inside and out. What’s the company’s total IT spending, and how does it compare with other companies? What’s the market price for the products and services it uses? What does it cost to provide a PC, take care of a help desk ticket, provide email or ERP, and keep servers running? Can the total spending be broken down on a percentage-of-revenue basis, a spending-per-person basis? Questions like these require a more detailed cost and data analysis than many IT organizations now perform. But when the CIO shows he or she really knows the numbers, other executives are more confident that IT spending is being managed well and that IT is being run at or below market prices. And there’s another important benefit: An IT department that thoroughly understands its own costs can confidently provide users with a choice of service levels and a range of charge-back fees. That is more like the choices consumers make in their personal lives. Bechtel Corp. CIO Geir Ramleth took another approach to financial insight: He benchmarked his company’s IT costs against Google, YouTube, Amazon.com and 15 other Internet-native companies. Ramleth found Bechtel’s per-unit IT costs were far higher than those at the other companies: at least 50 times more per megabit for networking than YouTube and nearly 40 times more per gigabyte of storage than Amazon. Bechtel had one system administrator for 100 servers, compared with one for approximately 20,000 servers for Google. That insight justified his move to an internal private cloud. Ramleth was able to cut Bechtel’s network costs by 98 percent, reduce the number of data centers to three, increase capacity tenfold and reduce latency (the time it takes for data to get to where it’s supposed to go) by adopting the best practices of these companies. “You can be very small and still do what we did,” says Ramleth. Instead of converting just one enterprise application, one form of user support or one part of the network at a time, replace them with the new systems in the largest chunks the company can manage—even entire layers of technology at a time. For example, when Accenture moved to a new global SAP platform, it retired 450 finance, human resource and sales applications and replaced them with a single, integrated global version. Many IT organizations prefer a seemingly safer and more manageable approach, replacing systems in small steps, a function or part of a function at a time. But when companies implement a new system in piecemeal fashion, they are operating at too small a scale to invest in the repeatable procedures and process automation required to replace systems quickly and consistently. The rollout is more error-prone and takes longer. Accenture experienced this when it first started to move to voice-over IP. The experiences of the first two or three offices that were moved to VoIP were painful because they were treated like one-time projects. The problems ceased when the program managers stepped back, came up with a standard procedure, and started implementing VoIP with the same step-by-step process in every office. Incrementalism carries other risks. Companies are slow to gain the benefits from the conversion. They must live with (and pay for) both the new and old systems simultaneously. The dissatisfaction with a long, drawn-out migration can cause the project to be canceled, leaving the IT organization supporting an IT infrastructure that’s half-based on today’s technology and half-based on tomorrow’s. CIOs need to revisit their organizations as well as their technologies. There’s much to take into account: the growth in consumer information technology, the increased availability and maturing of cloud and other business IT services, and all those technology-endowed customers and employees. At DuPont, Tram is restructuring his organization into five major global competencies: governance and strategy; business-facing and process-supporting IT; IT operations, integration and partner management; continual improvement; and transformation management. He is also turning to outside services to provide and manage mature technologies and business processes. In a large organization, the business case for replacing systems will vary by office location. Networking costs in the United States are relatively low, for example, while those costs in South Africa are high, and the business case there may not be as strong. CIOs that separate out the business case by location will receive funding for the locations with the highest ROI, but they may lose funding after the high-ROI parts are completed. When Accenture replaced its telephone systems, the IT executives made a business case for doing the transformation at all of the company’s 300-plus locations. The IT management team did not prioritize the locations with the best business cases, then go back and try to justify converting the locations with the worst ones. In essence, the locations with the worst business cases rode the coattails of the good locations. Accenture eliminated its old telephone systems everywhere—reducing costs while bringing IT to a new, higher standard of performance. Executives have a choice. They can delay making needed changes, putting their operations at risk of obsolescence and even irrelevance. Or they can stick with their analysis and seize this opportunity to rethink and restart IT. The good news is that between the strengths of these new technologies and services, the enormous savings they can provide, and the strong desire for real change, there never has been a better time to restart your IT. After all, information technology has become universal, cheap, powerful and simpler to use. Shouldn’t it be managed differently from when it was limited, expensive, less capable and more complicated? The Accenture Institute for High Performance’s Futures of Enterprise IT study identified more than 60 economic, social, geopolitical, demographic and technological forces that could influence the future of enterprise IT. These technological and economic forces in particular are driving the need to fundamentally reconsider IT infrastructure, organization and governance. Platform shift to cloud computing and services. Software, process, infrastructure and platform services provide quick, scalable access to powerful, minimal-maintenance technologies any place high-speed Internet connections are available. Open architectures incorporating Web APIs (application programming interfaces) offer an easy way to publish or receive streams of data. Organizations will migrate to these technologies as the IT industry provides better, less costly and more flexible options to server-based systems. The rise of consumer technology. Every business is now a digital business. Consumers, employees and managers are using their own devices, social networks and other consumer IT services to work, shop and purchase. The gargantuan consumer clouds run by Google, Amazon and other companies are far more powerful than those private companies build for themselves. Changing user behaviors. Technologies like smartphones, social networks and broadband, along with mass access to information, are permeating and changing everyday living. Expectations for workplace computing, and the way they use IT and information, are being shaped by your employees’ IT experiences in their personal lives. Greater need for business agility and faster IT implementation. Technology is accelerating change in virtually every industry. IT-enabled global competition, and competition from new companies with business models built around new technologies, requires companies to respond to threats fast, and quickly spot and seize opportunities. The murky business environment only intensifies the need for responsiveness. Changing IT consumption and delivery models. Smartphone apps, self-service app stores and software-as-a-service are providing an easier and faster-to-use model than traditional software purchasing and installation. IT-dependent business processes can be obtained as a service through the Internet, rather than operated as an internal process. Big data exceeding capabilities of SQL-based databases. More and more of the data analysts need to produce insights is unstructured and non-numeric. Relational database tools were never intended for, and are ill-equipped to deal with, today’s quantities of data and its lack of structure. Executives willing to make their own IT decisions. Today’s executives have grown up with IT, studied IT in business programs, make their own technology choices in their personal lives, and have their own visions for the CFO or CMO role. They will take on more IT responsibility, rather than shy away from it. Venture capital investment in consumer technology. R&D and venture capital is going into cloud and consumer technologies. Future IT innovation will be targeted at consumers first and then adapted for businesses instead of the other way around. A research fellow at the Accenture Institute for High Performance in Boston, where he specializes in IT strategy and management. Accenture’s chief technology & innovation officer and serves as the senior managing director of the company’s Technology Strategy & Innovation group. He is based in New York. A former managing director of information technology research at the Accenture Institute for High Performance in Chicago. The former chief information officer of Accenture. He is based in Chicago.